The UN human rights office says that Islamic State forces are using civilians as human shields, as they face an Iraqi-Kurdish offensive trying to recapture Iraq’s second city Mosul. 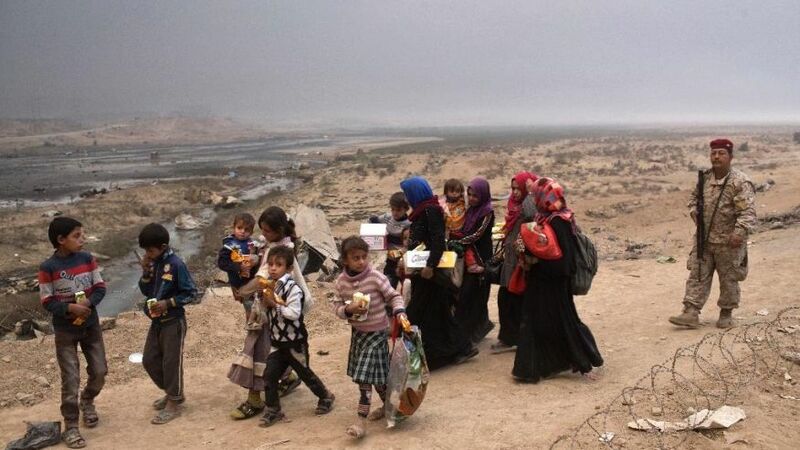 The UN High Commission for Human Rights said on Friday that ISIS has abducted tens of thousands of men, women and children from areas around Mosul, placing them in strategic sites in Mosul. It said the Islamic State had killed at least 232 people on Wednesday, including 190 former Iraqi troops and 42 civilians who refused to obey their orders. “ISIL’s depraved, cowardly strategy is to attempt to use the presence of civilians to render certain points, areas or military forces immune from military operations, effectively using tens of thousands of women, men and children as human shields,” said the High Commissioner for Human Rights, Zeid Ra’ad al Hussein. Earlier, UN human rights spokeswoman Ravina Shamdasani cited “credible reports” that ISIS had carried out abductions and “forcibly relocated numbers of civilians inside the city” since the Iraqi-Kurdish offensive began on October 17. She said almost 8,000 families, of roughly six people each, were seized in four sub-districts including Shura: “Many of those who refused to comply were shot on the spot”. Iraqi and Kurdish forces appeared to be pausing their advance on Mosul, regrouping after initial gains on some fronts but also stiff Islamic State resistance. Earlier this week, advance Iraqi special forces closed within 4 km (2.5 miles) on the front east of Mosul. They then stopped to allow other units to reach them, and for forces to move on other fronts. After taking a series of villages to the north, Kurdish peshmerga have been positioned for days around Bashiqa, a key town for supply lines, about 20 km (12.5 miles) from Mosul. In the south, the Iraqi army and federal police are still about 30 km (19 miles) from the city. To the west, Shia militias repeated on Friday that they are about to begin operations near Tal Afar, 55 km (34 miles) from Mosul. The militias issued a similar statement just after the start of the offensive. However, there are concerns about sectarianism, prompting resistance from the Sunni population, if the Popular Mobilization Units join the fight. The US and its allies have been concerned that many in the militias are linked to and even led by Iranian forces. The UN’s Shamdasani said on Friday that the UN already has reports that some individuals insouth of Mosul have “embarked on revenge killings and have vowed on television that there would be ‘eye-for-eye’ revenge against those who sided with ISIL [Islamic State]”. NextSyria Analysis: Lessons from Russia’s Intervention — But Will Anyone Learn Them?